No one can know what is between me and God. Happy New Year, may it be a contented one for you. If you are looking for me in particular, the only classes I'm taking are on Tuesdays at Beulah Community Centre. If you are struggling with lower back pain and have read about exercise helping it, and would like to go through some lower back exercises that you can practise before going on to other physical exercise, I still do 1-2-1 classes on request. My aim is very much to give you the confidence to start moving again. In the West, most people say they practice yoga when they are actually practicing one strand of yoga, namely Hatha Yoga which is designed to strengthen the body and to make it as healthy as possible. All my classes focus on Hatha Yoga although I do call for mindfulness of the breath, introducing early stages of Prana yoga, the strand that looks at breath control and I always relax a class at the end of a session. For those of you who find my web site and enjoy it, you are very welcome. A few of you have told me you really appreciate the information here. 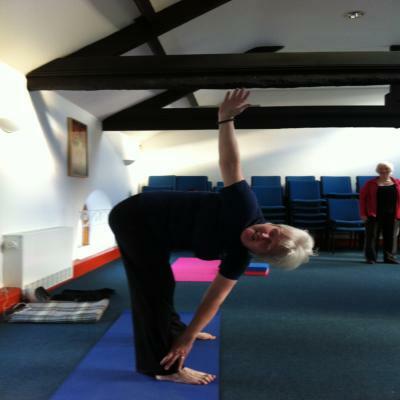 On this site you will see photos of postures by my yoga students from my Cardiff classes, some of whom are in their seventies and eighties!. We have deliberately shown you people practicing modifications as they work towards a posture as well, as it is important to realise that a modification can help you improve gradually. This is very important to understand if you are carrying any injury or are recovering from sciatica, or other back problems. Don't worry if you are not beautifully slim and flexible, you only have to do your best and feel your body respond and enjoy the postures we practice in class. And somewhere along the line, you may suddenly realise that your arthritis isn't feeling as bad or your jeans are looser than they were... but that is just a bonus, a gift you receive when you start practicing yoga regularly. My classes stick to Hatha yoga and relaxation. I learnt a style many years ago which is called Iyengar yoga, it has an excellent way of teaching Hatha Yoga. When I first started there were no qualifications needed to teach. You were simply taken to one side and told that they thought you were good enough to teach and would you start next week! Hatha yoga is one strand of eight that make up the yogic search for inner peace. Hatha yoga works on the body. Everybody can benefit from Hatha Yoga one way or another. 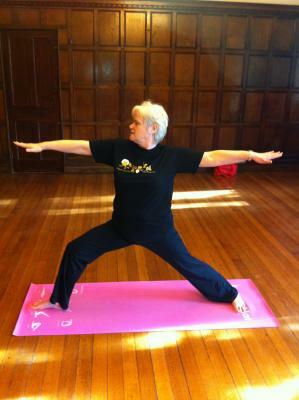 I am also available for 1-2-1 yoga sessions or for small group yoga sessions. Just contact me at my e-mail address below to check availability. If you have back problems, or if you would like a one-to-one session, drop me an e-mail at helenlloydjonesradyr@gmail.com or phone me, my contact details are below. Yoga is terrific for helping back problems but you do need to have very specific attention to begin with before progressing into practicing the range of postures available. You also need to know how to manage your back problems and what you can safely do to exercise and strengthen your back. Have a look on the back care assessment page. Because I teach Adult Education with Cardiff Council I was given the chance to attend a training session on Screening Awareness. It was really interesting. In Wales we have Breast Screening, Cervical Screening, ( both for ladies only) Bowel Screening and for men only Abdominal Aortic Aneurysm Screening. These tests can save your life so they are worth having. More information here.